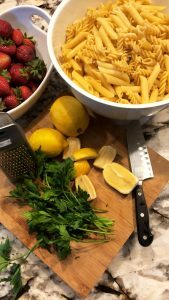 I love anything LEMON and what can be better than PASTA and LEMON all in 1 recipe????? I was pretty tired of eating spaghetti or Alfredo pasta…so I wanted something a little different for dinner. I had a few pieces of chicken breast in my freezers that I got last week and a half bottle of artichoke heart that was from the little get together we had over LABOR DAY weekend. 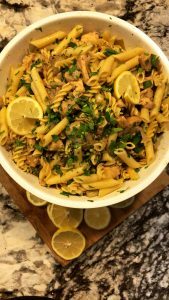 I remember going to a friends little spa get together a few months ago and she had this lemon chicken pasta..that had some artichoke hearts, black olives and sun dried tomatoes..and it was DELICIOUS…so I wanted to see if I can make something similar tonight for dinner…I didn’t have any sun dried tomatoes so I omitted that in my recipe. I made a DOUBLE BATCH because I knew I was gonna have a super BUSY WEDNESDAY …I wanted to make enough for dinner and lunch for the kids and still have some for the following night DINNER. My lil guy LOVES it!! He asked me if I can pack him a HUGE PORTION for lunch!!! I was more than HAPPY to oblige. If you are looking for something EASY to make and extremely flavorful…you gotta try this!!! In a large skillet over medium heat, heat olive oil. Add chicken and season with salt, pepper and garlic powder. Cook until no longer pink, 10 minutes. Meanwhile, bring a large pot of salted water to a boil. Cook pasta ( I used penne pasta) according to package directions until al dente. Drain, reserving 1 cup pasta water, and set aside. Transfer chicken to a plate and add butter to skillet. Let melt, then add garlic and red onion. Cook, stirring occasionally, until soft, then add lemon juice, zest, and lemon slices. Stir in crushed red pepper flakes. Pour in 1/4 cup reserved water. 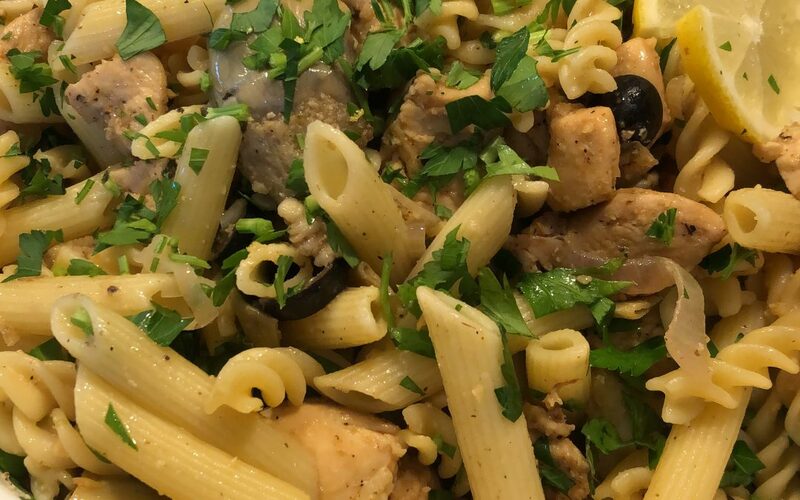 Return chicken to skillet, along with artichoke hearts and black olives. Gently toss until everything is incorporated, 2-3 minutes. Garnish with parmesan, parsley and lemon sliced. **** season according to taste…you might need to add more salt. 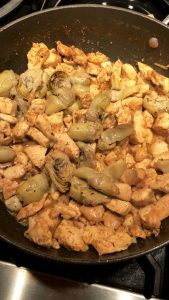 Saute the chicken breast with artichoke hearts…. SIDE NOTE: If you like…substitute Tony Chachere’s for salt…it is so much better.